Here I will explain how to bind gridview with datatable in asp.net using C# and VB.NET or create datatable dynamically and fill / bind gridview datasource in asp.net using C# and VB.NET. In previous articles I explained insert xml data to sql table using stored procedure, Highlight gridview rows based on search in asp.net, create online poll system with percentage graphs in asp.net and many articles relating to xml, Gridview, SQL, jQuery,asp.net, C#,VB.NET. 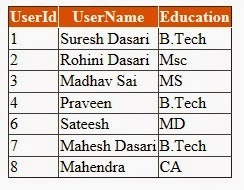 Now I will explain how to bind gridview with datatable in asp.net using C# and VB.NET.